Dovetailing Tip: Use leftover steak carnitas saved from Meal 1. While preparing the rest of the ingredients, place the carnitas in a heat-proof dish and heat in a 300°oven until ready to top the burrito bowl. Marinate the steak in the cilantro lime marinade for 2-3 hours in the fridge. If you are in a rush you can also marinate the steak and cook it right away. After the steak has marinated, heat a heavy duty pan or griddle and coat with 1 teaspoon of oil, cook the steaks for 2-3 minutes on each side then remove and allow to rest for 5 minutes before cutting. After removing the steak from the pan add the sliced onions and bell peppers. be sure not to wash the pan in order to keep all the flavor of the steak. cook the onions and peppers for 2-5 minutes or until the edges are golden. While the steak is cooking chop the veggies and arrange along with the cilantro lime rice in a big bowl or platter. 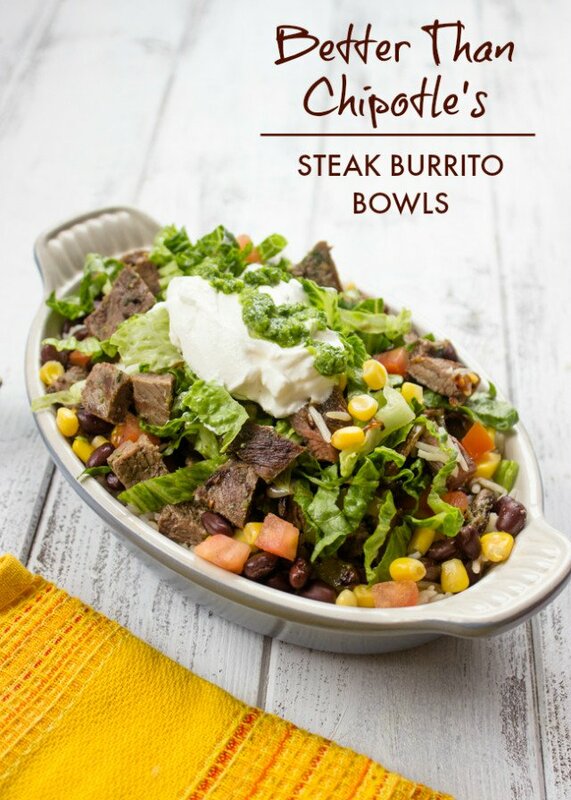 After the steak is cooked and cut layer the burrito bowls in small individual bowls. Place a layer of rice, a layer or beans, tomatoes, and corn, layer of steak and onions, layer of salad, and then top with a sprinkle of cheese and a teaspoon of sour cream.